Discover the possibilities with StarTech.com, the industry leader in USB-C and Thunderbolt 3 connectivity. Make the switch and discover the benefits. USB-C is the connector many have dubbed “future proof.” With its small and versatile design and the capabilities to carry multiple protocols, including those with advanced data rates and power, it’s not hard to see why this label fits. One port means simple connectivity. With USB-C, no matter what operating system, laptop brand or display connection, all users can share the same adapters and cables. With its reversible design, USB-C also offers frustration-free connections which allow users to easily connect the first time. The shift to USB-C has already begun with companies like Apple, Dell, Lenovo and Microsoft including the port on some of their latest devices. With researchers predicting that 70% of computers will feature USB-C by 2021, this new connector is quickly becoming the industry standard. The USB-C connector brings you more than just your basic USB functionality. It can carry everything from USB 1.1 to USB 3.2 Gen 2x2, as well as DisplayPort and HDMI (via Alt modes) and Thunderbolt 3 (on Thunderbolt 3 equipped laptops). That kind of versatility means this single connector brings users more productivity and possibilities than ever before. USB-C connectivity for all of your needs. We'll help make the switch easy. USB-C is the connector of the future, and as more industry manufacturers incorporate it into their devices, adapting is inevitable. We can help make the switch easy by offering educational resources and a toolbox of reliable USB-C accessories. We offer the widest selection of USB-C & Thunderbolt 3 adapters and cables to cover all your connectivity needs. StarTech.com offers an extensive line of certified cables that help you maximize your laptop’s performance. Hassle-free, Plug & Play collection of adapters that are pre-configured to support all operating systems. StarTech.com has USB-C connectivity accessories to fit every operating system, laptop brand and connectivity need. Trusted by IT pros around the world for our rigorous inhouse product testing, robust compliance, and lifetime multilingual technical support. Rolling out USB-C across your organization? For questions about USB-C or help transitioning your team, contact our 24 hour technical support team, available Monday-Friday. 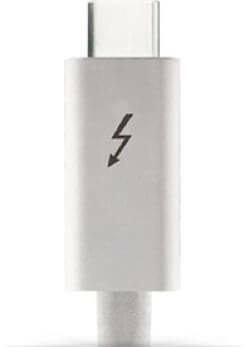 * Thunderbolt capable devices must be used to ensure compatibility with Thunderbolt 3 technology. Plugging USB-C device into a Thunderbolt 3 port will limit the performance of Thunderbolt 3 port. Discover the right USB-C solution for you. StarTech.com is not only a trusted connectivity advisor for IT professionals around the globe, but our products are also used by over 80% of fortune 500 companies. We ensure our customers are never left without the critical connectivity parts they need to complete their technology solutions. Our products are ensured by warranties, certifications and rigorous testing. Get the products you need when and where you need them. Everything worked perfectly the first time without any issues, including simultaneously charging the MacBook. The included USB-C cable and USB-C to DisplayPort cables are high quality and the perfect lengths for my setup. I ordered this as soon as it was available, and it has solved my problem of connecting TB2 devices to my TB3 port on the Dell XPS computer. This docking station is just what I’ve been waiting for, something to free up my AC adapter and allow a one-cable connection for everything… it worked flawlessly with my MacBook Pro, no drivers to install, no issues whatsoever! I have one of these in each boardroom to avoid confusion and last minute scrambles. This is a rugged device and should be added to the toolkit of any road warrior!